This add-on trip takes you either to Arenal, Monteverde or both. It is a great idea to add it after having spent some days at the Pacific Coast. Hike to a waterfall, learn about the most recent volcanic eruption or go horseback riding with a 2 or 3-night package to Arenal Volcano! Relax in the hot springs nearby after a full day of adventures. 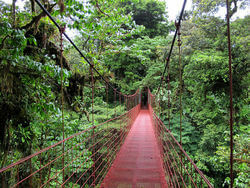 Or discover the beautiful Monteverde Cloud Forest, a real paradise for nature lovers. 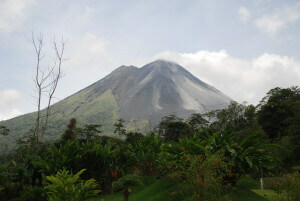 Arenal Volcano is a hot spot destination, and a must see in Costa Rica! An otherwise dormant volcano that erupted unexpectedly in 1968 destroying the small town of Tabacon, Arenal is surrounded by rainforest with plenty of wildlife and plants for your eyes to feast on. There are lots of opportunities for adventures in this part of Costa Rica. Your tour includes transportation from your hotel in Puerto Viejo or San Jose to Arenal, two nights accommodation in La Fortuna, an afternoon spent hiking and viewing the volcano, a visit to some hot springs and a horseback ride to a picturesque waterfall. Additional nights to explore the area on your own can be added. There are daily departures from hotels on the Caribbean coast, San Jose, and most Pacific coast towns. Transportation is in a comfortable minibus with air-conditioning to La Fortuna, a small town at the base of the volcano, where you will be dropped off at your selected hotel. You will have plenty of time the first afternoon and evening to explore this charming little town on your own. The following day you will be picked up at your hotel at 8:00am to visit the La Fortuna waterfall by horseback. Customize your package by choosing a different tour (or more than one). 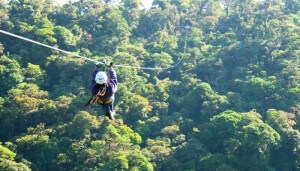 Options include the Arenal Hanging Bridges, the famous Sky Trek/Sky Tram Zip Line/Canopy tour, explore the jungle on an ATV tour or visit the Lost Canyon on a canyoneering adventure! In the afternoon. you will explore the 1968 Trail to learn more about the story of the eruption and get some fantastic views of the volcano. After the hike, you can relax in the beautiful Los Lagos Hot Springs (or you can choose from several other hot spring options in the area). These hot springs are in a tropical garden setting and a great way to unwind from your hike. The night ends with an extensive and delicious dinner buffet. Your tour ends in Arenal. 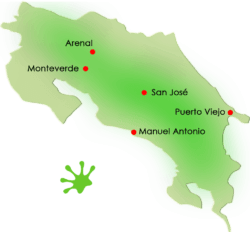 You can also add extra nights in Arenal so you can explore more on your own or we can arrange transportation to San Jose, the Pacific or the Caribbean coast. Optional add-on to Monteverde from just $199 per person. Here is one more idea what to do in Costa Rica: Monteverde is famous for its world renowned cloud forest; this high altitude rain forest has plenty of unique flora and fauna lending an almost magical air to those who experience it. We’ll pick you up in San José and take you to your Monteverde hotel for a one-night stay. You will do a wonderful hiking tour in the Monteverde Could Forest, which is a nature lover’s paradise! The next morning you’ll travel by van and boat across Lake Arenal to La Fortuna. Duration: Three days/two nights. Additional days can be added. Includes: • Microbus transportation from your hotel in San Jose or most Pacific or Caribbean beach towns to Arenal. • Two nights of lodging based on double occupancy at a hotel in La Fortuna (private bath, hot water, jacuzzi and swimming pool) or your chosen hotel option (price difference applicable). For single occupancy, an adjustment for the extra room cost will be added. For triple or quad occupancy, your rate will be reduced accordingly. • Entrance to and dinner at Los Lagos Hotsprings. • Tour to the waterfall on horseback. • Taxes and Gecko Trail service charge. Not included: • Return or onward transportation from Arenal; this tour ends in Arenal or onward transport can be added for an additional charge. Duration: Two days/one night. Additional days can be added. Accommodations: Includes accommodation at Claro de Luna or similar. If you have a particular hotel request, let us know and we’ll advise if we can book that for you and what the price difference would be.